The $40 bln drug distributor is carving out its languishing healthcare IT business and merging it with one owned by LBO firms Blackstone and Hellman & Friedman. Cost cuts and attentive management should help make it more valuable. Only excessive debt might impede a full recovery. 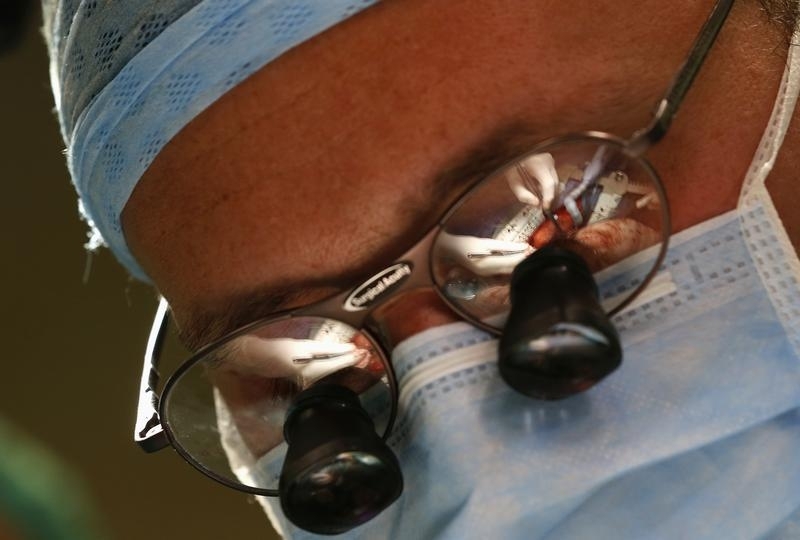 A heart surgery operation led by Professor Jan Pirk is reflected in the glasses of doctor Marian Urban at the Institute of Clinical and Experimental Medicine (IKEM) in Prague, June 28, 2012. McKesson said on June 28 it would separate its information-technology business and merge it with rival Change Healthcare to create a new company with about $3.4 billion in revenue. Under terms of the deal, McKesson will own about 70 percent of the combined company and the rest will be held by Change’s existing owners, the private-equity firms Blackstone and Hellman & Friedman. They plan to take steps toward an initial public offering in the months after the deal closes, which they expect in the first half of 2017. The new company has received commitments for $6.1 billion of funded debt related to the deal. About $2.7 billion will be used to pay off existing Change Healthcare debt. McKesson will receive a $1.25 billion cash payment and Change owners will get $1.75 billion. The rest is earmarked for transaction-related expenses. The companies expect $150 million in annual synergies by the second year following the deal’s completion.